Vembu provides a simple and efficient solution for backing up the business applications like Microsoft Exchange Server, Exchange mailbox, SharePoint, SQL, Outlook and MySQL. 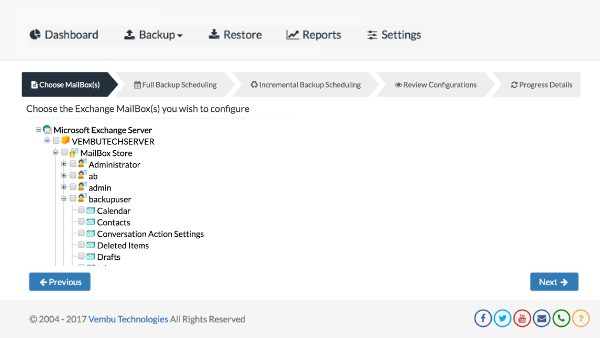 Vembu application backup will take a consistent backup of the application using the unique plugins designed for each and every application and with the help of native APIs of that specific applications, only the changes are backed up in the successive incremental backup schedule. If the application gets crashed or the files of the application gets deleted accidently or even machine running with these business application get failed, the application items can be recovered easily from the backed up application data and one can rebuild the production environment without any hassle or worries. 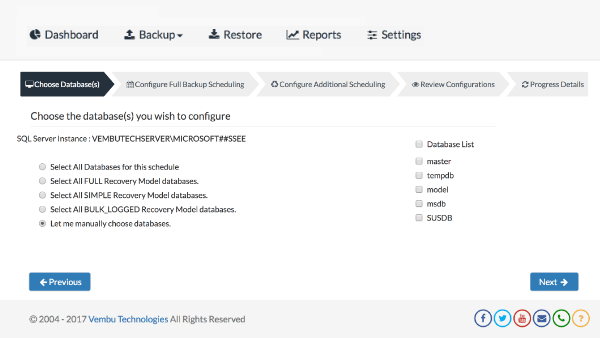 Microsoft Exchange servers plugin of Vembu MS application backup supports backing up of entire Microsoft Exchange servers and its database running on Virtual and Physical Environments. 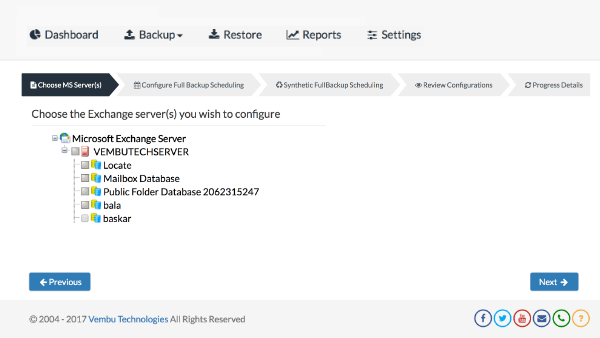 It also provides a complete MS Exchange Server Backup by backing up of all or individual databases, which provide greater storage management flexibility. When the exchange application gets corrupted or crashed, they can be easily recovered from the backed up exchange data. Microsoft Exchange Mailbox plugin of Vembu MS application backup supports backing up users’ mailboxes at folder level, IT administrator can take backup the individual or entire mailboxes of exchange application including the messages, contact, calendar, etc. and store the backed up data on a secured Vembu BDR server. When the application gets corrupted or crashed, mailbox, folder or subfolder of the exchange items can be easily recovered from the backed up data. Collaboration tools like MS SharePoint Portal Server are now common in most companies. 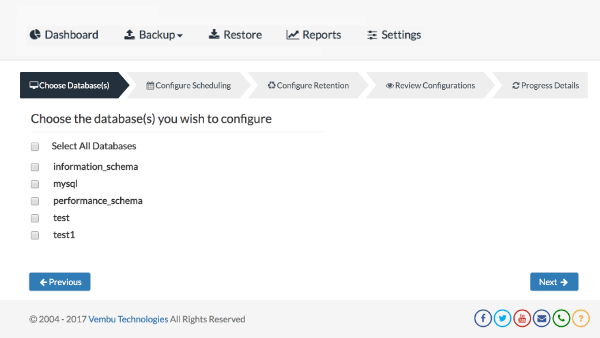 The SharePoint plugin of Vembu MS application backup allows the users to backup entire SharePoint site collection or a specific site inside a site collection available in local machine. In the case of crash or failure of SharePoint Server, the document and sites can be recovered easily from the backed up application data. 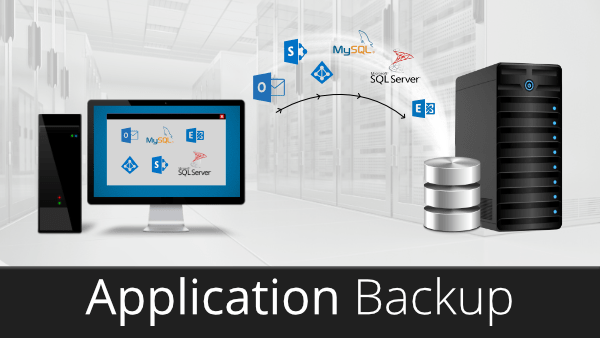 Microsoft SQL plugin of Vembu MS application backup supports backing up of the system and user databases of the SQL Server available in local machine and only the modified database and transaction logs will be backed up in the successive backup schedules. In a case of application failure or database corruption, the user can restore the SQL Server environment with the help of backed up data. Using MS Outlook plugin of Vembu MS application backup, one can backup various outlook components like E-mails, Contacts, Calendar, Tasks and Notes. With the latest incremental backup technology only the modified items and newly added mails are alone backed up. The backed up data is stored on the backup server and it can be restored swiftly and efficiently at any time during a crash or disaster. 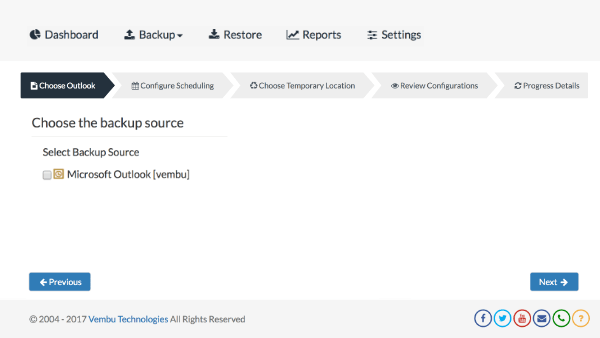 Vembu supports backup of MySQL databases and tables. 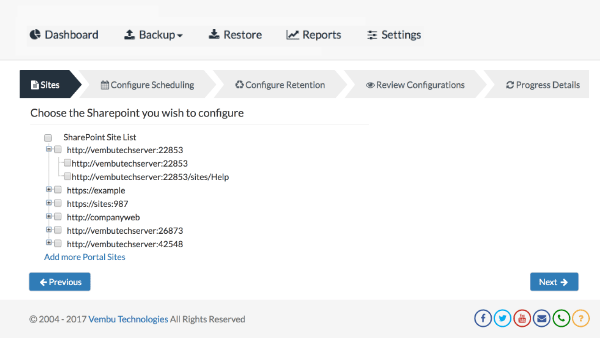 It supports Full and incremental backups for MySQL databases even when the data is online and is still being accessible by other other applications.